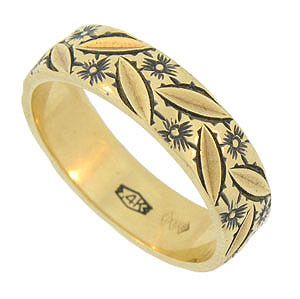 A riot of engraved leaves and flowers dance across the surface of this 14K yellow gold estate ring. Jewel engraving and darkened detailing gives added dimension to this handsome wedding band. 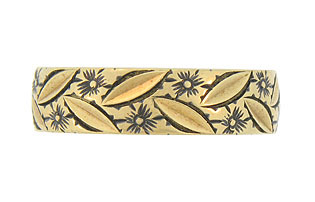 The ring measures 5.93 mm in width. Circa: 1950. Size 10 1/4. We cannot re-size.